Pr e s by te r i a n s To d ay | OCTOBER/NOVEMBER 2017 29 seen, to listen to the stories that our partners are hearing from the refugees and displaced people they are supporting, is profoundly impor- tant at this moment," said Kraus. "We've seen the sacrifices they've made, the cost of leaving everything and crossing rivers and mountains to communities and countries they don't know and sadly find them- selves viewed by some as a threat to the American way of life." Krehbiel says she's inspired by refugees who continue to seek better lives through the most difficult circumstances. 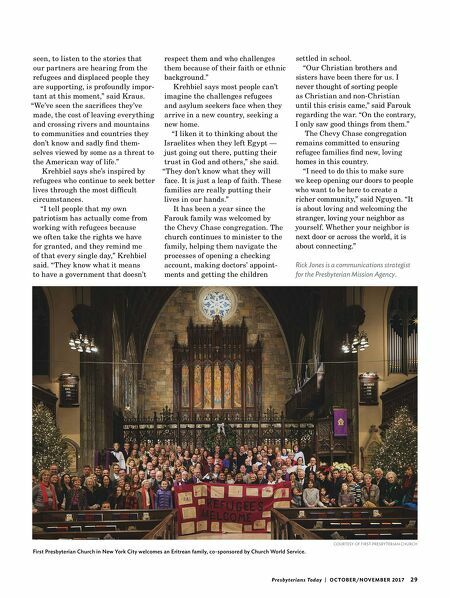 "I tell people that my own patriotism has actually come from working with refugees because we often take the rights we have for granted, and they remind me of that every single day," Krehbiel said. "They know what it means to have a government that doesn't respect them and who challenges them because of their faith or ethnic background." Krehbiel says most people can't imagine the challenges refugees and asylum seekers face when they arrive in a new country, seeking a new home. "I liken it to thinking about the Israelites when they left Egypt — just going out there, putting their trust in God and others," she said. "They don't know what they will face. It is just a leap of faith. These families are really putting their lives in our hands." It has been a year since the Farouk family was welcomed by the Chevy Chase congregation. The church continues to minister to the family, helping them navigate the processes of opening a checking account, making doctors' appoint- ments and getting the children settled in school. "Our Christian brothers and sisters have been there for us. I never thought of sorting people as Christian and non-Christian until this crisis came," said Farouk regarding the war. "On the contrary, I only saw good things from them." 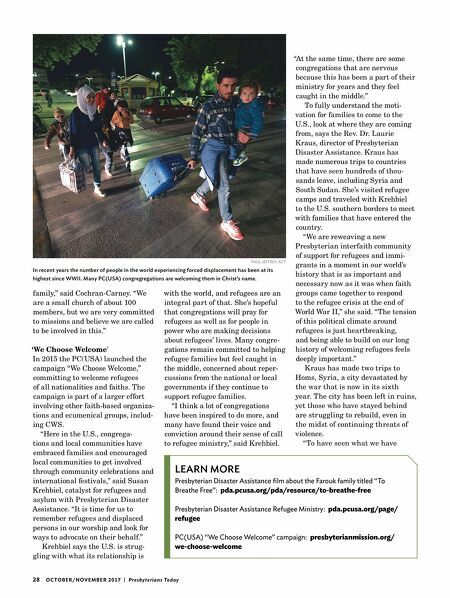 The Chevy Chase congregation remains committed to ensuring refugee families find new, loving homes in this country. "I need to do this to make sure we keep opening our doors to people who want to be here to create a richer community," said Nguyen. "It is about loving and welcoming the stranger, loving your neighbor as yourself. Whether your neighbor is next door or across the world, it is about connecting." Rick Jones is a communications strategist for the Presbyterian Mission Agency. COURTESY OF FIRST PRESBYTERIAN CHURCH First Presbyterian Church in New York City welcomes an Eritrean family, co-sponsored by Church World Service.